With Orera released after only 24 hours in psych care last week, we had no choice but to secure the 2 lit­tle boys at the home of one of our pastor’s in a remote vil­lage where she couldn’t find them. The week before her hos­pi­tal­iza­tion, it was a night­mare try­ing to keep her from kid­nap­ping the chil­dren. The trauma to the 2 lit­tle boys, as well as the other orphans and the fos­ter moth­ers had to con­sid­ered, and was the best solution. We were given per­mis­sion to take the boys else­where until their SOS trans­fer could come through. (Paper­work took this whole week to orga­nize, as the boys didn’t have birth cer­tifi­cates.) Papers were finally in order as of 7pm Sat­ur­day, May 30th. The lit­tle ones, accom­pa­nied by Social Ser­vices and our 2 Children’s Lead­ers will be dri­ven by Eric Dry to Pemba on Mon­day for admit­tance into the SOS home for chil­dren. This is a secure orphan­age where the boys will meet their lit­tle brother and sis­ter for the first time, as they were removed from this same mother over 3 years ago. So we are hop­ing it will be a very happy fam­ily reunion. With­out our help, these lit­tle ones might not even be alive today, so we are very grate­ful that God brought them across our path. 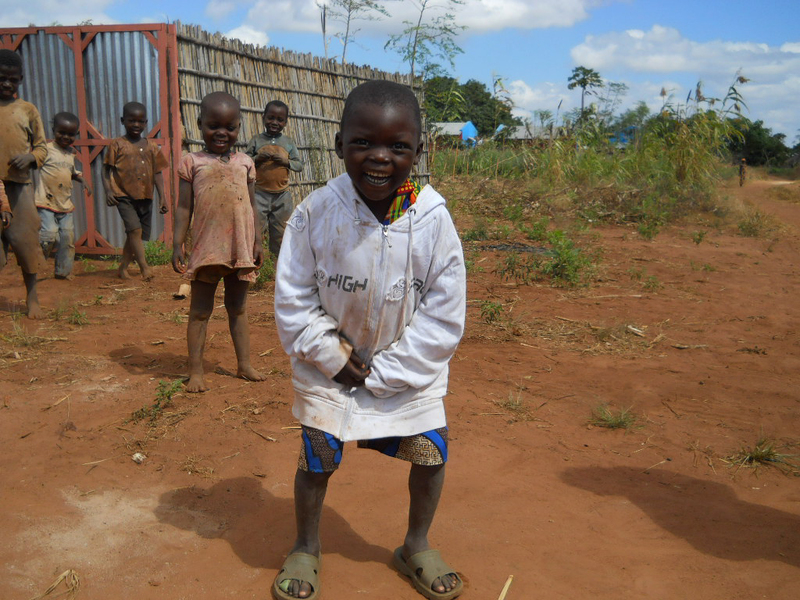 They will be missed as they are both very lov­ing chil­dren, but we are able to visit when we go to Pemba. June 1st is National Children’s Day here in Mozam­bique, so we cel­e­brate it as the annual birth­day party for all 95 of the orphans liv­ing with us! We had a great party this morn­ing. AWANA GAMES, play­ing on the swings, and slide, as well as play­ing chase and all the other fun things kids enjoy, was the pro­gram of the day. Activ­i­ties ended when lunch was ready, as the goat from our herd, who was our guest of honor, should not be kept wait­ing. Best eaten while hot on top of a big bowl of locally grown rice. With over 140 chil­dren and their fos­ter moth­ers in atten­dance, it was truly a blast! 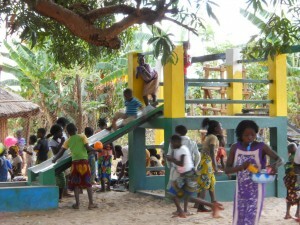 The kids were lined up on top of the slide ramp, going down our new slide as fast as they could man­age. The swings never stop swing­ing, and that play­ground is now the most pop­u­lar spot in all of Balama! Our churches are com­ing through by pro­vid­ing 1,900 of the 2,700 bags of corn we need for June, and 100% (1,200 bags) of what we need in July (the super dry corn). Our barn is now EMPTY, as the 300 TONS of corn from 2013 is fin­ished. 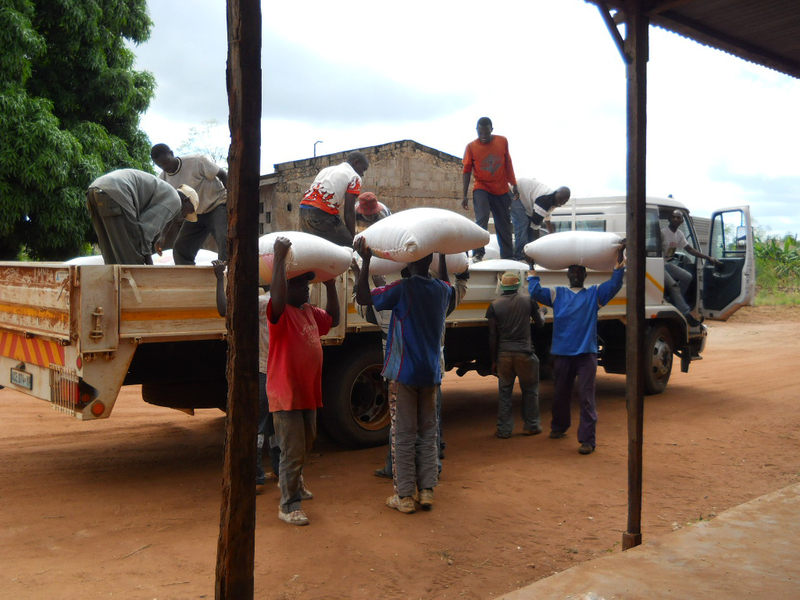 Our 2 large trucks will begin rolling in with the first 400 sacks of corn on Mon­day morn­ing. 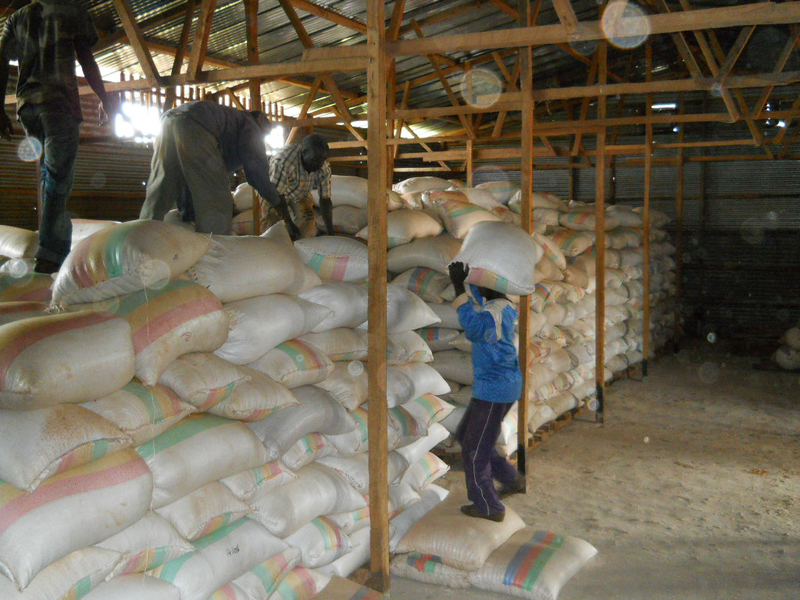 Each sack weighs around 140 lbs (70kg). Tues­day, our team of 3 vis­it­ing mis­sion­ar­ies, George, Katie, and Hanna will help us begin the stor­age pro­cess­ing of the corn. Katie has com­mit­ted a year of her life to help­ing us in Mozam­bique. From Seguin, TX, Katie learned of us when I spoke at her church in recent years. She has taken to Moz. vil­lage life very well, and all we hear now are the kids yelling “KATIE, KATIE” when we pass by the playground. Han­nah Gilman, from Wash­ing­ton State, has com­pleted 18 months of her RN train­ing, and is the “adopted grand­daugh­ter” of my good friend and Chris­t­ian Author, Lau­raine Snelling. 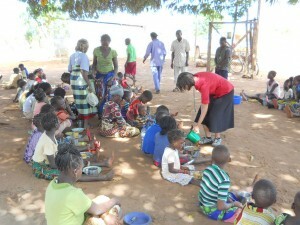 Hanna loves chil­dren and wants to learn all she can about treat­ing African dis­eases while help­ing out this sum­mer. She’ll return to school in late August. We’ll be up to our ears in CORN this week, so keep us in prayer as it is a BIG JOB work­ing with 100 Mozam­bi­can men who will be mov­ing 25 to 40 TONS of corn a day. THE JOSEPH PROJECT (fill­ing the barns for the time of hunger), offi­cially opens Mon­day at 6 a.m. As the rooster crows, the work begins! For sev­eral months, 2 lit­tle boys and their mother “ORERA” (name changed), an intel­li­gent woman who is now men­tally ill, have been in our food pro­gram. Orera’s ill­ness made her rest­less and she roamed the streets a lot with her chil­dren in tow, mak­ing it hard for us to deter­mine how well she was car­ing for her chil­dren. 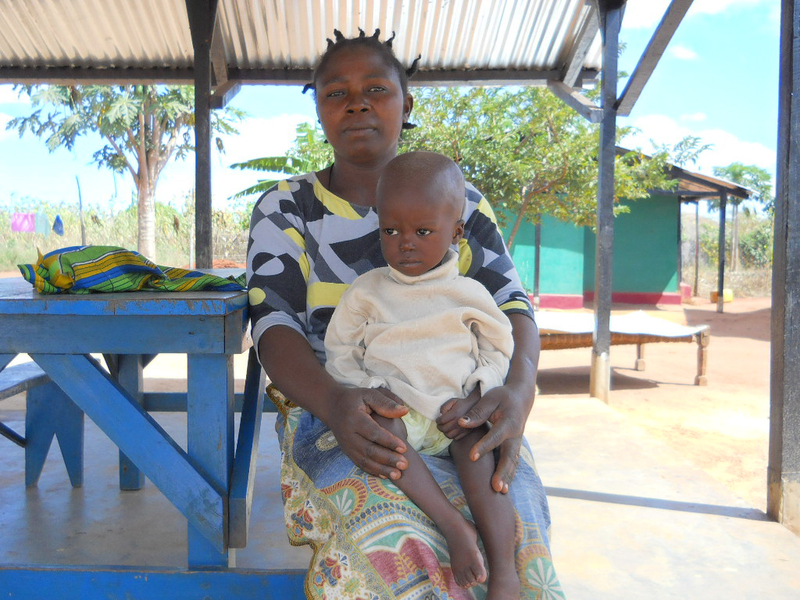 On May 15th, Orera came for her food hand-out, and it was obvi­ous the 3 year old was seri­ously ill with malaria and bron­chi­tis. She refused to allow us to take her to the hos­pi­tal and ran away, refus­ing treat­ment for the lit­tle one. Since the inspec­tors were here, I brought this case to their atten­tion. Orders were called to the hospital’s doc­tor to eval­u­ate the sit­u­a­tion, which they did on Mon­day, May19th. (took us that long to find her again). When eval­u­ated, the 3 year old was SERIOUSLY mal­nour­ished and ane­mic (unable to stand). It was the first time she had allowed any of us to see his lit­tle body. 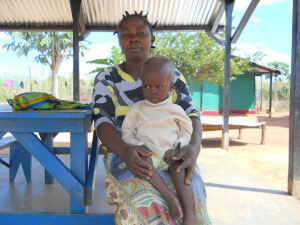 Seven long hours later, both boys were in our care with proper med­ical treat­ments in hand, and the mother was admit­ted for psy­chi­atric super­vi­sion and malaria treat­ment. She escaped twice from the hos­pi­tal that first day, but by spread­ing the word, we were able to locate her by sun­down, and get her back to her room. This sce­nario con­tin­ued for the entire week! She escapes from the hos­pi­tal, tries to kid­nap the chil­dren from our fos­ter homes, we sub­due and return her to the hos­pi­tal for fur­ther treat­ment. It was EXHAUSTING and STRESSFUL on all our staff to say the least. After 5 very DRAINING days of deal­ing with this sce­nario, the hospital’s doc­tor trans­ferred her late yes­ter­day after­noon with the help of our truck, 2 guards, 2 fam­ily mem­bers, a psy­chi­atric nurse, and our office man­ager. As of today, she has not man­aged to escape the regional hos­pi­tal, PTL! And will be fur­ther eval­u­ated to see what treat­ment might help her become more functional. THREE year old, LINDO, (means handsome/beautiful) has 4 prob­lems (malaria, severe ane­mia, bron­chi­tis, and severe malnutrition). He was unable to stand as his mus­cle mass is non-existent in his legs. In real­ity, he looks to be about 18 months old, and won’t eat unless some­one hand feeds him, because doesn’t like spoons. His brother told us that is the only way his mother fed the lit­tle one and it is all he knows. He LOVES PEANUTS, so the 2 fos­ter moth­ers car­ing for him fixed him spe­cial Moz. dishes with peanuts. He loves his new moth­ers, and is totally con­tent and doing well. Food, Hypo and vit­a­mins to build his immune sys­tem, and a LOTS OF LOVE are the key to any child’s heart, and Lindo has responded beautifully! CANETO, the 5 year old, is fairly healthy, but TERRIFIED of his ill mother. When we found where she had aban­doned him, he told us he had not eaten in 2 days! I imme­di­ately got him some food and he wolfed it down. He told us that when his mother did give them food, it was only cook­ies and some­times beer as she liked to drink it. With good med­ical treat­ment and high pro­tein diets, both boys are show­ing a fast recover and even a small weight gain in the last 5 days. I gave Caneto a lit­tle Hot Wheels car that a vis­i­tor had left behind. He actu­ally didn’t know what to do with it, as he’d never seen a toy car before. Show­ing him how to play with is was truly a JOY! He never lets go of it now as it is in his lit­tle hand every time I visit him. He loves hugs which makes me happy too! Res­cu­ing these 2 lit­tle ones, and help­ing their mother, pretty much con­sumed our time this week, but sav­ing lives is what we are all about. As I write this, I received word that both boys will be trans­ferred to the SOS home in Pemba later this week, so they can be with their 2 sib­lings who were taken from this same mother over 3 years ago. SOS is a high secu­rity orphan­age with fos­ter care homes sim­i­lar to ours, and a great place for these 2 lit­tle ones to grow up. We are not set up to han­dle con­stant prob­lems when the mother is released, so totally agree that this is the best place for the boys. We also want them to grow up with their older sis­ter and brother. One thing is for cer­tain. With­out our inter­ven­tion, both boys most likely would not be alive today. I am very happy, God had us in the right place at the right time. These 2 pre­cious lit­tle ones are pre­cious in HIS SIGHT! 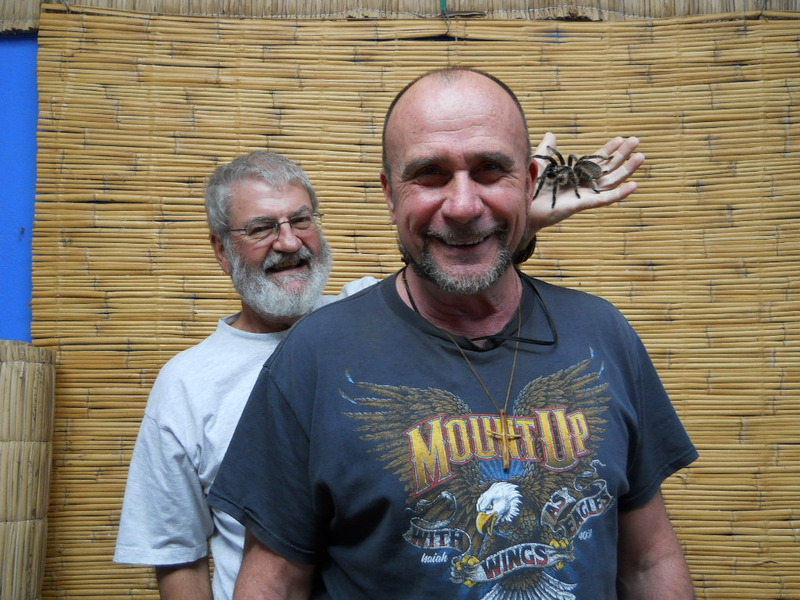 George is an expe­ri­enced prison min­is­ter and Bible teacher who teaches in Uganda. God placed us in the same Vic­tory Church meet­ing in Tulsa last year where I spoke a few min­utes on what we had accom­plished. I jok­ingly told him “come see us some­time” and George did just that! Bring­ing over valu­able sup­plies for our chil­dren that can only be obtained in the USA, he was a super bless­ing even before he arrived! One of the things he trans­ported was the super strong SWIVELING SWING MOUNTS for our play­ground. The kids are going through ropes faster than a hot knife through but­ter. That isn’t hard to do when those swings don’t stop mov­ing for 12 hours a day! With the new “ SWIVELING” swing mounts, all 4 swings can be mounted with chain, which will last much longer. George can only stay a month, and will assist me at the barns as the corn starts rolling in JUNE 2nd! Two more vis­i­tors will be arriv­ing next week to also help out with the corn har­vest. Will tell you their sto­ries next week. MOVING DAY… WE ARE A BIT OVERLOADED, BUT THE WHEELS STILL MOVE! It was a looong 3 days of “show and tell” to reveal all the types of children’s pro­grams we use, with detailed hous­ing inspec­tions of all 26 houses (included the 23 houses of wid­ows with their orphaned grand­moth­ers), brief­ings on doc­u­ment require­ments for final licens­ing, and the final summary/results yes­ter­day at 11a.m. This is the cul­mi­na­tion of THREE YEARS OF HARD WORK and it is a great relief to have it behind us. (com­pares to get­ting your PHD) Our “file” is lit­er­ally a dis­ser­ta­tion of every­thing we do, right down to the kid’s weekly food menus! In three weeks, we will receive a 12 month CREDENTIAL CERTIFICATE which makes us a legal Fos­ter Care Facil­ity while we write the final doc­u­ments miss­ing from our “2 inch thick” file that must go to Maputo for the final licens­ing. This final licens­ing can take 6 months to a year to obtain, as the National Social Ser­vices peo­ple must scru­ti­nize every part of our program. The WHOLE WEEK was cen­tered around mak­ing this place all “spiffy” clean with new touches of paint on the children’s pre-school and the mother’s homes where the kids had been a bit rough on the walls. 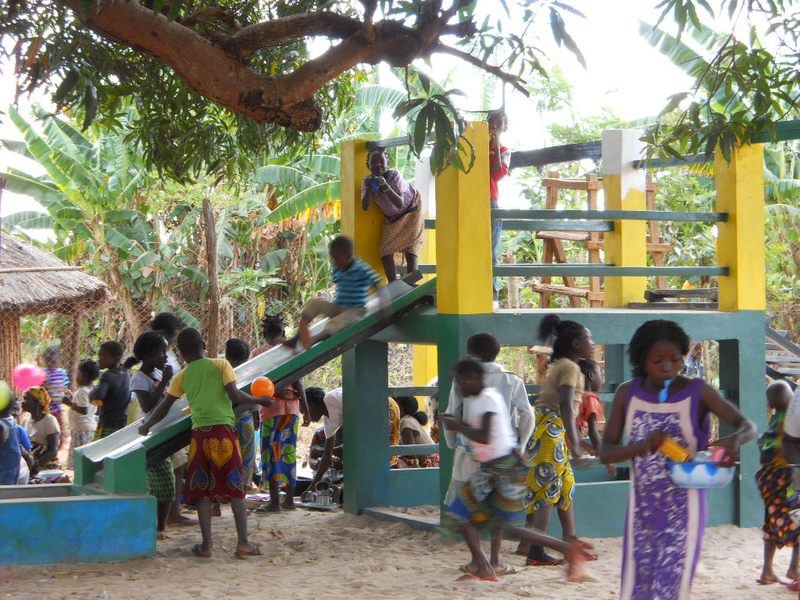 The inspec­tors were totally fas­ci­nated with the NEW PLAYGROUND and our AWANA games/teaching pro­gram, as they had never seen those types of games before. Many pho­tos and videos were taken by the head inspec­tor, (includ­ing pho­tos of me teach­ing one of the lady inspec­tors “by exam­ple”, how to go down a slide). They all got a big laugh out of that, which helped break the ice on our first day. These young adults were deprived of slides and swings to grow up on, due to the destruc­tion of parks in the time of war. Their sin­gle sum­mary com­ment says it all! “We like the changes VERY MUCH”. Keep on mov­ing for­ward by enforc­ing the children’s teach­ing pro­grams.” God moved on our behalf, thanks to the prayers of many of you. THANK YOU for all you have done to sup­port us via prayer and finances so that these orphans can have a future. 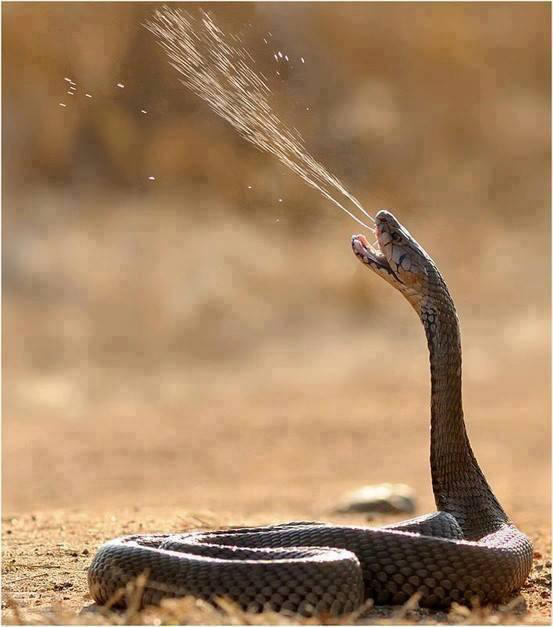 SPITTING COBRA IN ACTION ! The snakes move­ment caught the eye of a vis­i­tor (who was not keen on first per­son encoun­ters with ven­omous bush crea­tures). I yelled “COBRA” and out runs our guard with his 12 ft. snake killing bam­boo rod, BUT, he couldn’t kill the snake with­out dam­ag­ing the truck. 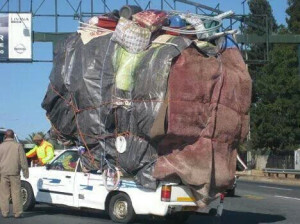 I told the owner to move the truck for­ward a bit, and was answered with a swift “BE MY GUEST! No way am I get­ting in that truck”. Bunch of city folks. So Bush Bunny showed them how it’s done. Get­ting the guard to dis­tract the snake, DE BUNNY jumps onto the run­ning board, opens the driver’s door, moves the truck 3 feet for­ward, and HEARS WHACK!!!! THE ZIPPY VINE SNAKE IS NOT MORE! City folks can be so, so funny. ALL snakes are to be respected, but expe­ri­ence teaches one how to deal with them in a safe man­ner. Besides, I have great angels, who are super great at mess­ing up a snake attack! That’s it for this week! We begin corn buy­ing June 2nd, and 3 vis­i­tors will arrive before the end of May. This week we drag out the clean­ing cloths, sweep the vis­i­tors hous­ing, and get ready for a new team and a “corny” June with our new found friends. 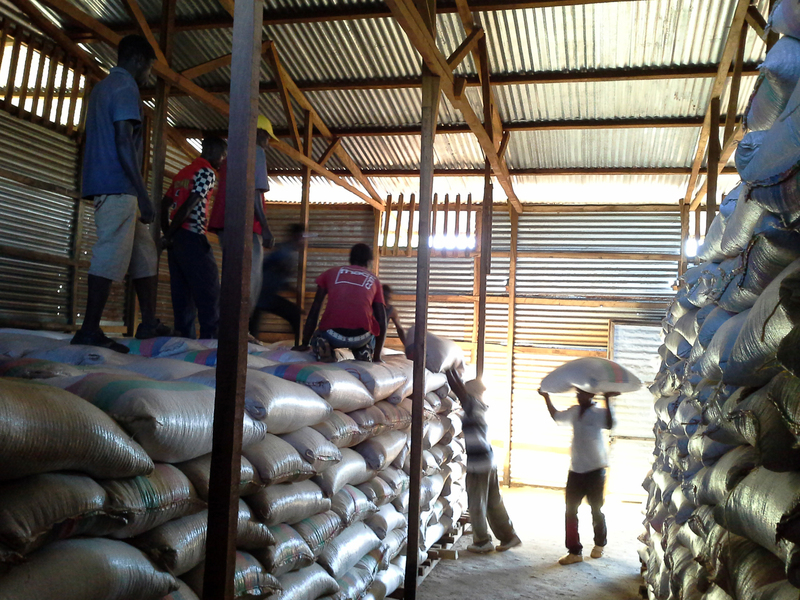 On Mon­day, the 92 tons of beans received last week, had our barn bulging at the seams when Manuel drove in with the final 6 tons on our 7 ton truck. On Tues­day, 77 spe­cially cho­sen men reported at sun-up to help pre­pare and stack those beans for storage. I t’s a once a year job that must be done with both beans and corn if our chil­dren are to have the proper foods for a healthy body. This year we treated, sacked, sewed, and moved those 1,400 sacks on the heads of this team in a record 4 days! Each sack weighs in at an aver­age of 154 lbs. or 70kg. Not an easy task, but these men are so pow­er­ful, they make it look easy. 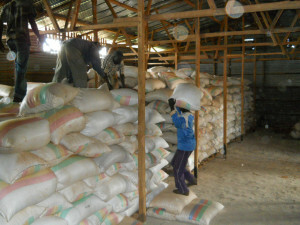 Fri­day this week saw the last 300 sacks stacked in our bean barn. That put a BIG SMILE on this Bunny’s face! 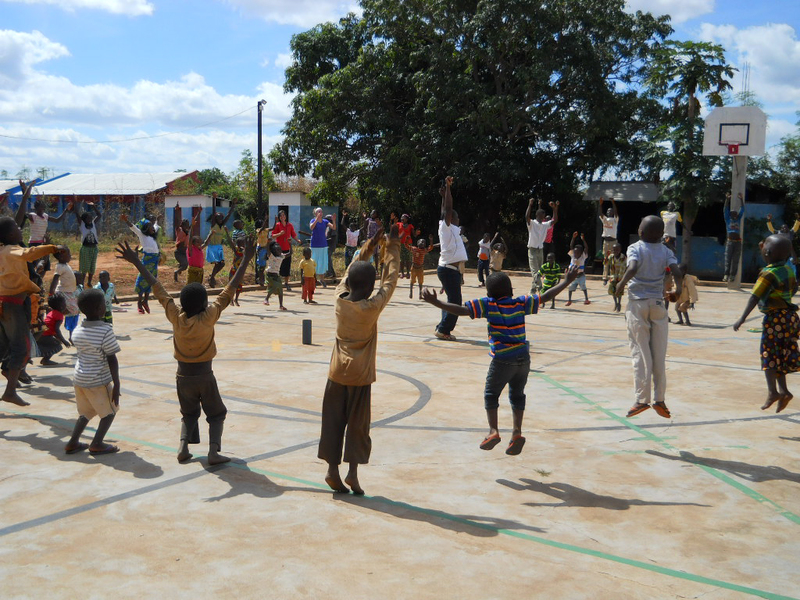 SEVEN CHURCH CO-OPS (bush churches in remote areas), pro­vided 1,100 of the 1,400 sacks needed for our chil­dren. Now THAT is a mir­a­cle! 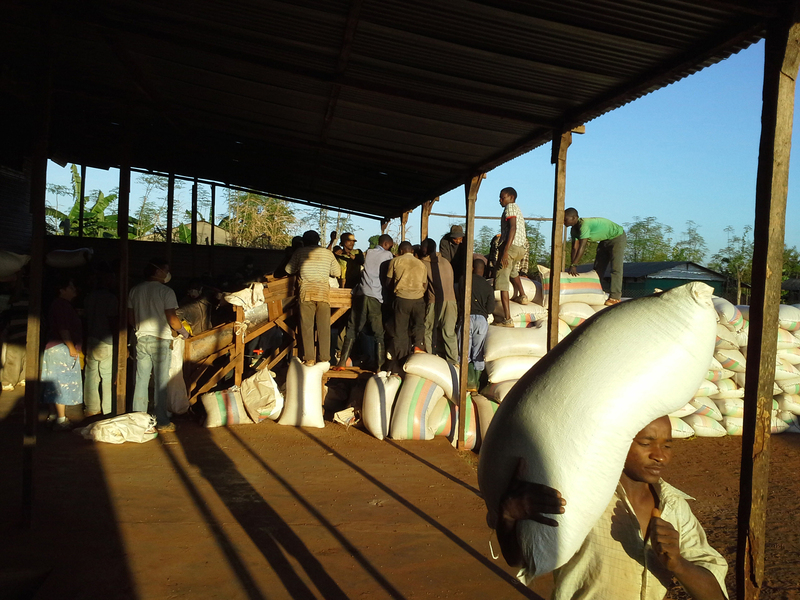 Con­stant church growth in our bush churches is the rea­son behind this great harvest. Happy, doesn’t come close to describ­ing my JOY, as this has been an “unspo­ken” goal that has taken 14 years to bear fruit. When God sent me to Balama to “res­cue and evan­ge­lize in 1999”, the vision of hav­ing enough church mem­bers will­ing to plant beans for our chil­dren was only a dream. To me, it’s a WIN-WIN sit­u­a­tion for the orphans are pro­vided with the pro­tein they need to grow up healthy AND the church mem­bers are able to sup­port their fam­i­lies with new clothes, foods, and nec­es­sary items that have to be bought like cook­ing oil, soap, and salt. Your LOVE GIFTS are now cir­cu­lat­ing through the Chris­t­ian com­mu­nity. Chris­tians bless­ing the Chris­tians in a for­eign land. A beau­ti­ful site to see! This is not large scale com­mer­cial farm­ing, but many, many hands each with a hoe, plant­ing, weed­ing, and bring­ing in the har­vest BY HAND, one bean pod at a time. The aver­age har­vest is 3–10 sacks per house­hold, and believe me that’s a lot of work for a once a year income. So be blessed, for your Love Gifts have blessed more than 250 church families. STATE INSPECTORS COMING NEXT WEEK! Folks we need your prayers for favor on Wed. night (Thurs­day morn­ing our time) for this is the FINAL inspec­tion that decides if we get our per­ma­nent orphan­age licens­ing or not. OUR GOD MOVES MOUNTAINS, and we expect Him to shove this one right into the sea! The 7 remain­ing chil­dren in the “Child Headed House­hold” of Nacala Vil­lage came to church last Sun­day with the 15 year old in tears. She told us it was too much to han­dle, as she could not man­age the 6 younger chil­dren on her own. Her older sis­ter, Marcelina, who died last week from com­pli­cated malaria, was always the one who held the fam­ily together. An imme­di­ate appeal was put out to find a woman will­ing to live in and help them out. I prayed for a woman with a true heart for chil­dren and God had some­one wait­ing to answer our prayers. The vil­lage “jun­gle vine” sent out a mes­sage Sun­day after­noon, and expe­ri­enced fos­ter mother Aliah (A-lee-ah), came to meet Evan­ge­list Salazar on Mon­day. Aliah is a very respected widow in the vil­lage and is very happy to mother these chil­dren in need . For $60, we were able to pur­chase a house right next door to the chil­dren, where Aliah will live. Aliah hap­pily agreed to help out for food, full liv­ing needs, and $48/month in spend­ing money. (This is the “nor­mal” rate for any one car­ing for chil­dren in the Balama area.) Thanks to a gen­er­ous donor, Aliah’s salary has been spon­sored through Decem­ber, 2014. The “yard” will be extended so that both houses will be in the same fence, and a 2nd latrine was added this week to pro­vide for the 8 peo­ple now liv­ing in this com­plex. A kitchen is being added on to the main house, as the kids have been cook­ing out­side on the porch, which is dan­ger­ous in high winds when you have a grass roof! DOING WHATEVER IT TAKES TO GET THE JOB DONE. Jesus did it and we know He expects us to fol­low His lead. But we couldn’t do it with­out all of you lend­ing a help­ing hand. THANKS for help­ing us res­cue this family. We are all count­ing beans in our sleep this week! 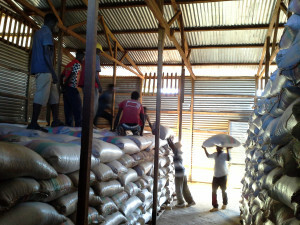 Our bean buy­ing per­mit was granted last Fri­day, so Mon­day morn­ing, the 2 trucks rolled out to fetch 410 bags of beans! The flow has been con­stant this week and we now have 87 tons in the barn. Get­ting them into our barn before the ille­gal buy­ers could grab and run with them is our goal this week. Our goal is 97 tons by next Tuesday. Andy Gon­za­lez has been a big help this week work­ing as dri­ver, bean bag hauler, and all around “gopher”. Good help is a bless­ing for sure!